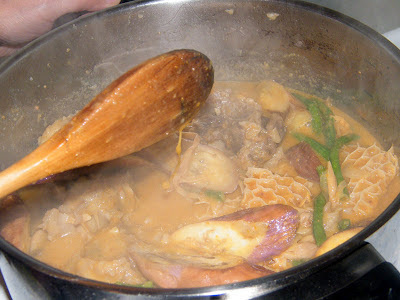 In a nutshell, Kare Kare is a traditional Filipino stew made from ox tail and tripe and vegetables, enriched with peanut sauce and alamang (fish paste). I do not know the origin of the name but this dish is as unique as it is called. My first kare-kare was cooked by my Nanay for a celebration (indeed, this dish does take a bit of time to cook so it's made when a guest is expected, or we are celebrating something). I was intrigued at why peanut butter was being used. In addition to this, it was also interesting how she toasted a handful of rice grains, ground it, then added it to the pot. 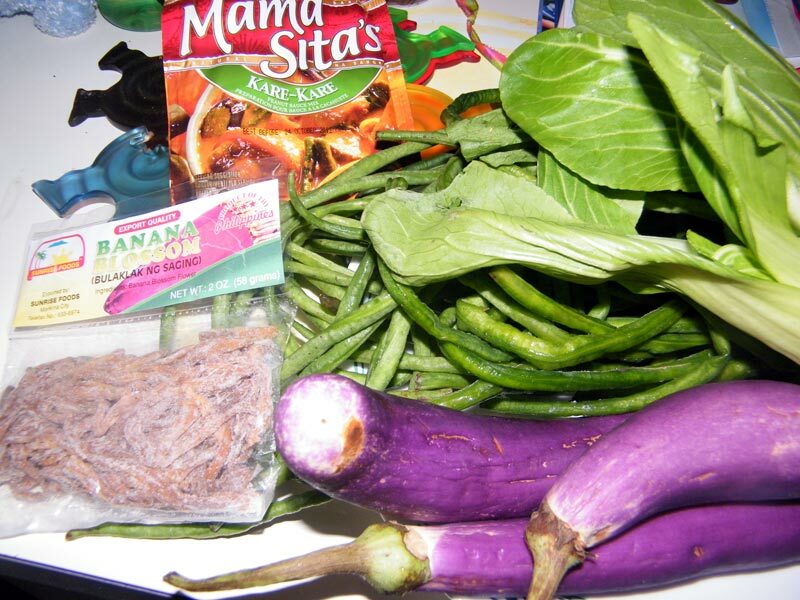 At meal time, I had a taste of Kare-Kare, which had a subtle peanut taste. I though that was all there was to it, when Nanay told me to add a bit of alamang (shrimp paste), and the dish burst into flavour! What an amazing dish. 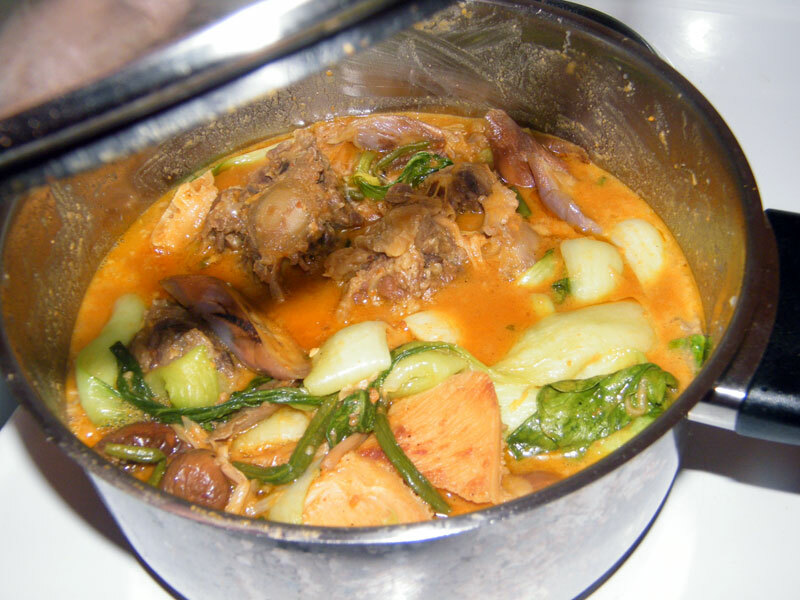 Here is my wife's version of Kare-Kare, which also tastes great. We had a guest stay with us for the night, and we had this for dinner. 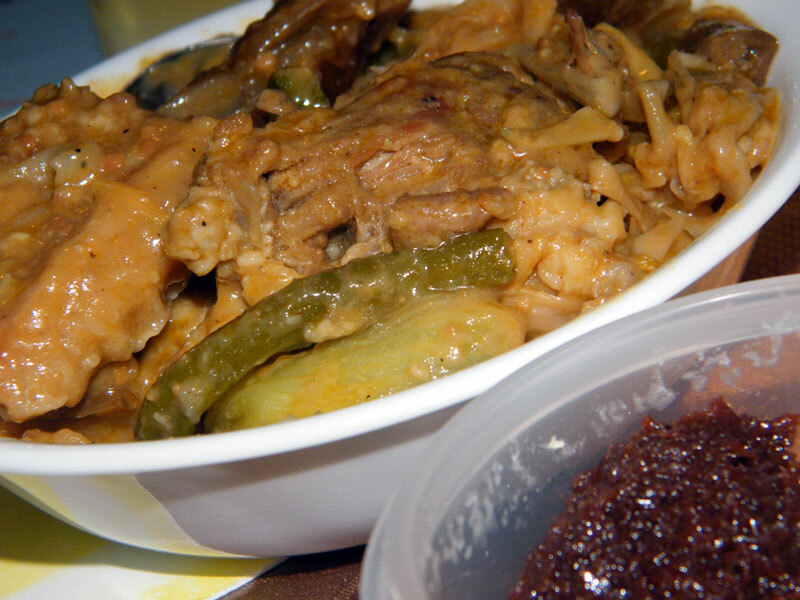 The next day, our guest asked if she could still have leftover Kare-Kare for lunch. She liked it very much and made her miss the Philippines. peanut butter - preferably one with oil visible on top such as Lily's Peanut Butter. I thought oily butter can only be found in our country, but was surprised to find a similar, local version on sale at Moore Wilson in the Wellington CBD! 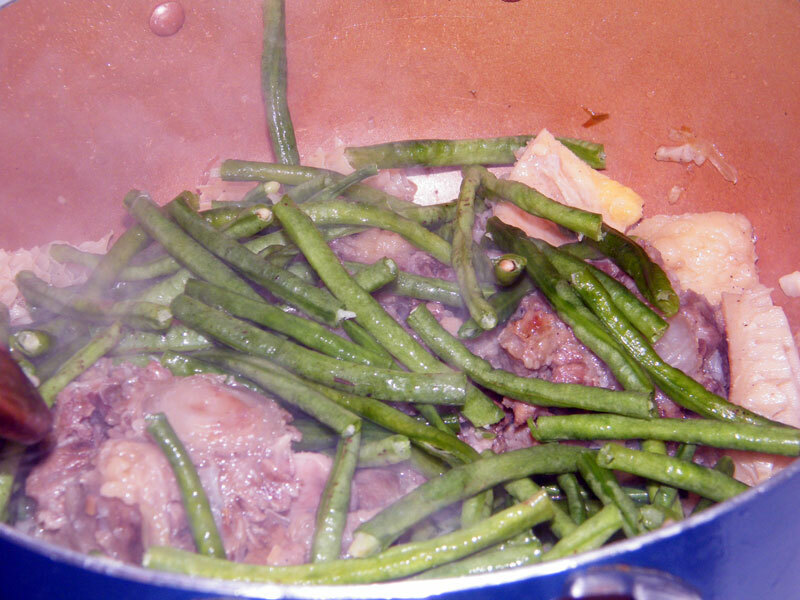 add also 1/2 cup ground unsalted peanuts and 1/2 cup toasted ground rice for a more faithful rendition of this dish. For the rice, get a frying pan (not sure if you can get the same result from a non-stick pan) and heat up the rice, shaking occasionally. The rice grains will eventually be coated in black. Remove from heat, then grind. 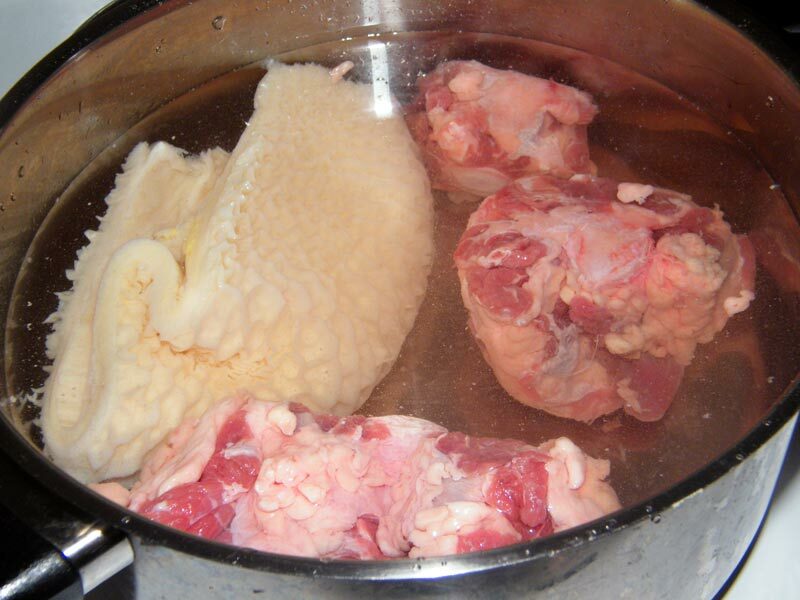 Place the ox tail and tripe in a pot of water. 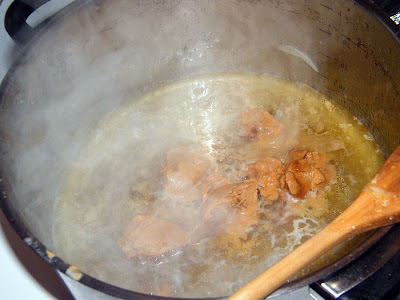 Let boil for a couple of minutes. 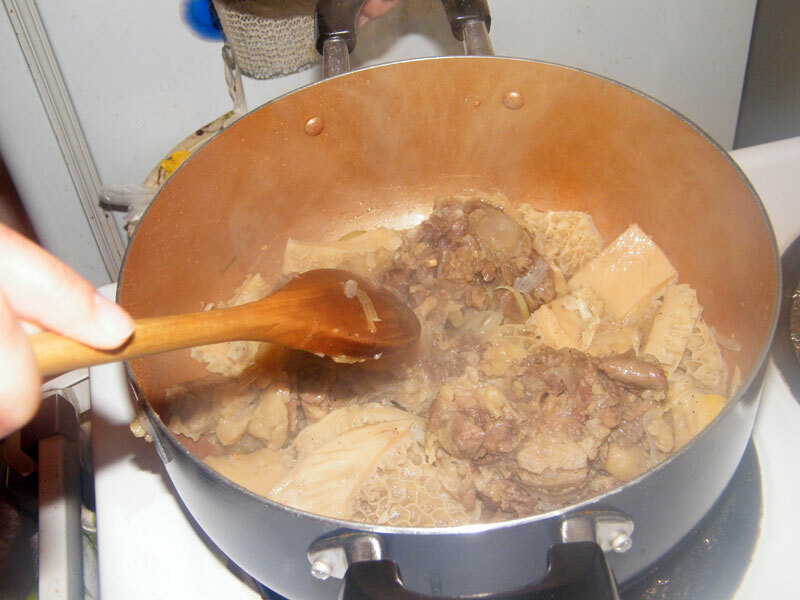 While the water would now be infused with flavour from the tripe and the ox tail, my wife said it also contains a lot of fat. So down the drain it goes. Then pour in a second batch of water, season with a good shake of salt and pepper, and let boil for 1.5 - 2 hours over medium heat. Get the tripe from the pot and slice. 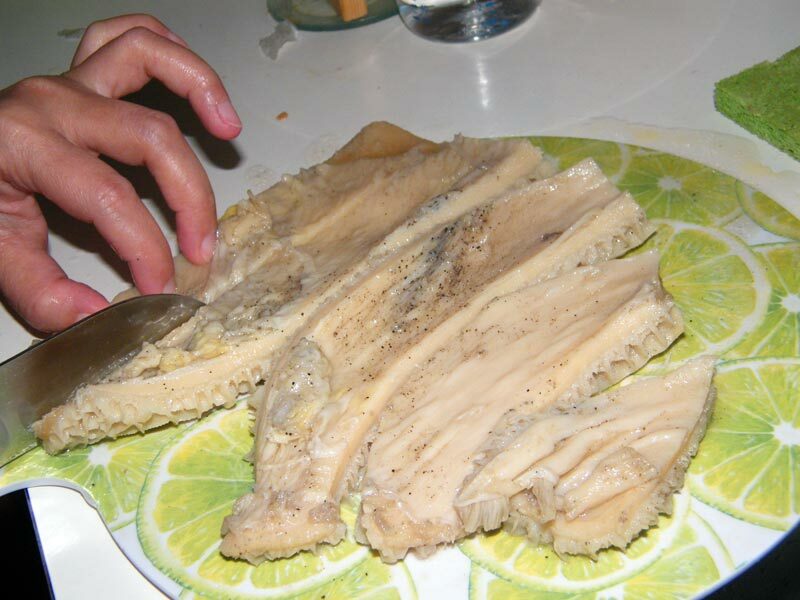 The tripe should now be soft enough to easily cut into bite-size pieces. 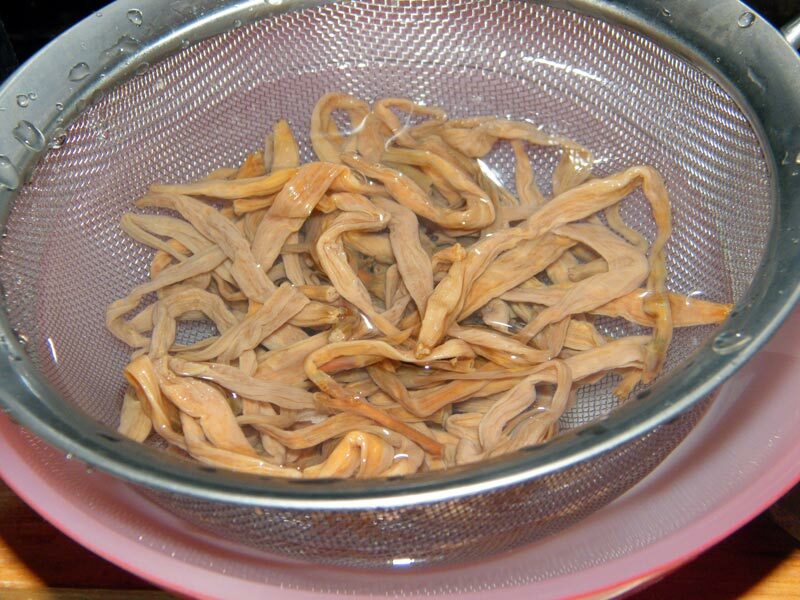 If you are using preserved banana blossom (like the one below), wash it off and submerge in water while you continue cooking. The seller at the store said we needed to wash it off and let it stay in water, as they have used this before and it tasted bitter when they did not wash it. 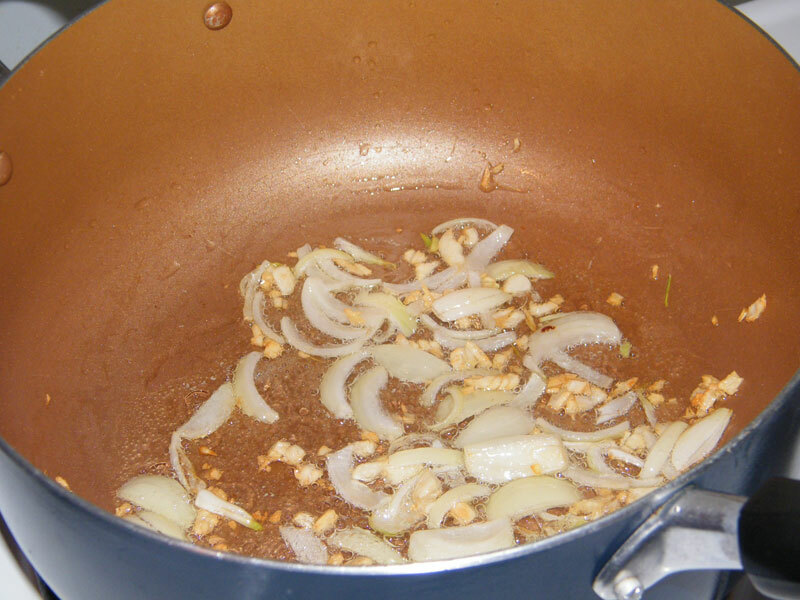 On another pot, heat up some cooking oil and saute the onion and garlic. Add the tripe and the ox tail and stir-fry for a couple of minutes. 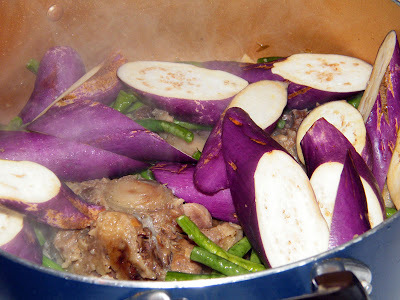 At this stage, you can also add the toasted ground rice. Add the string beans, and after a couple of minutes, add the eggplant. Mix slowly and let cook for another couple of minutes. Prepare the Mama Sita kare-kare mix as per direction. Use some of the broth to dilute this. Pour into the pot and simmer. Add the banana blossoms. 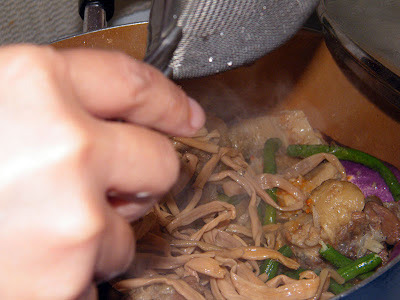 Lower the heat a bit as we now need to work on the peanut sauce. The water from which we boiled the tripe and ox tail might be too much. We are not exactly cooking a soup! So it's ok to discard some of the water, just make sure to set it aside instead of throwing it away in case you miscalculate the amount. 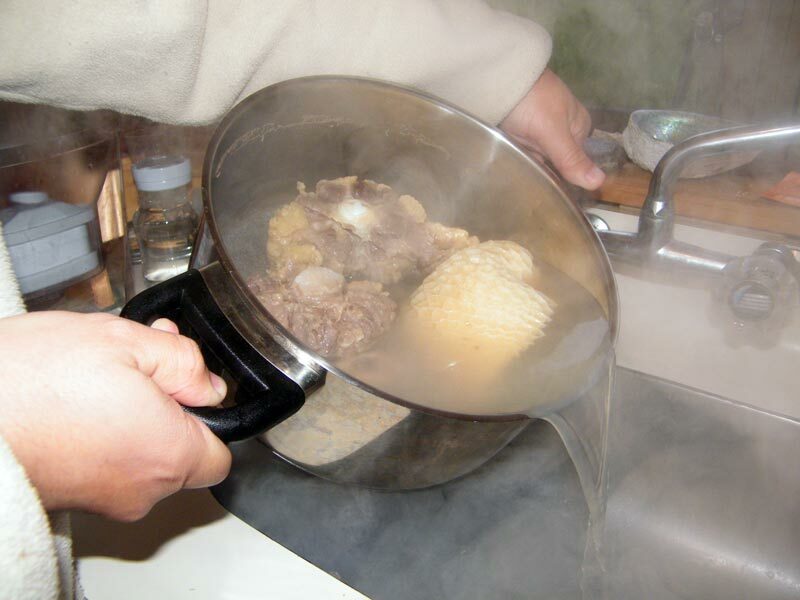 Heat up the broth. Add the peanut butter, starting with half a cup, and mix. We are looking for a smooth sauce, so add more peanut butter if needed. Also, you may add the ground peanuts at this stage. 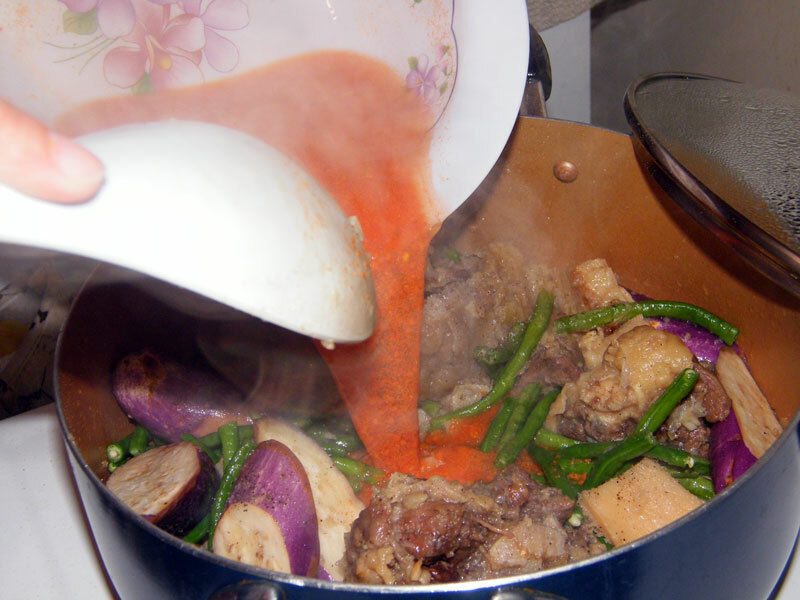 When you have achieved the desired consistency, pour this sauce onto the other pot containing the solid components of the dish. Mix, then cover and simmer for about 5 minutes. 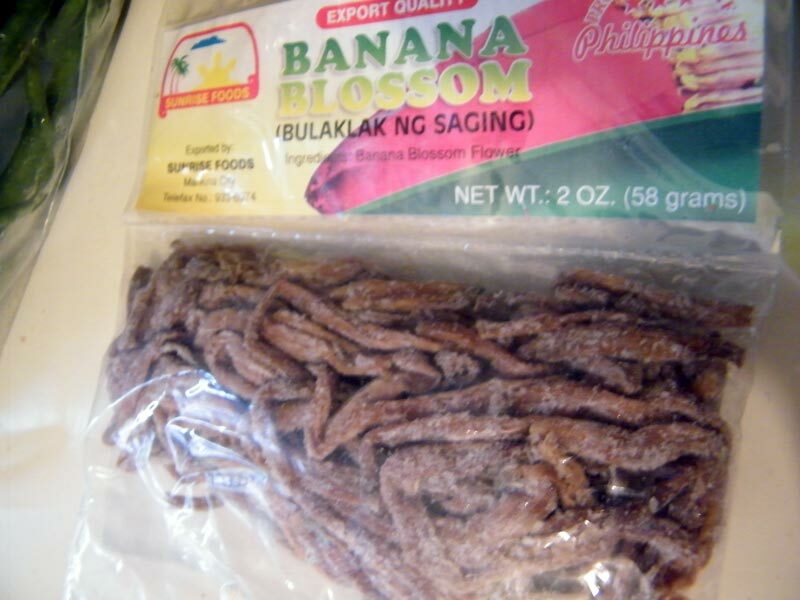 Serve hot with alamang (shrimp paste) on the side.